Occupational Therapy groups utilize carefully structured sensory-motor activities to promote exploration and enhance neurological processing of movement and sensory experiences. Our Occupational Therapists have extensive experience working with children. Speech Therapy groups focus on social pragmatics as well as functional communication skills. 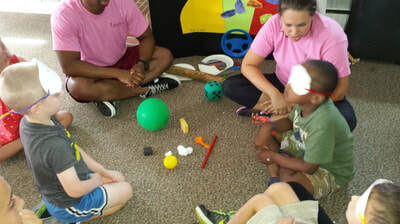 Our Speech Therapist assesses the needs of each group and also addresses oral motor and articulation needs to optimize speech success for each camper and group. Music Therapy groups focus on music exploration, rhythm, timing, and sequencing. These components are important for self regulation, praxis/motor planning, and overall organization. Campers will explore a variety of musical instruments while engaging in musical games and activities. 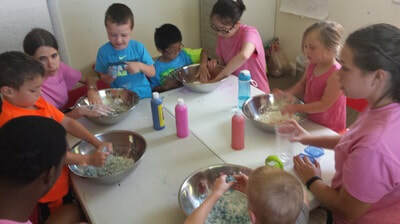 During Therapeutic Art, campers work on individual and group art projects that incorporate tactile exploration and self expression while working the small muscles of the hands and fingers as they manipulate and create. Self regulation is the ability to monitor and control one's behaviors, emotions, and thoughts and the ability to change them as needed. It is important for the development of self awareness and self esteem, and enables social success. At camp, counselors and therapists implement a program to help children identify and adjust their level of arousal. Children will learn through sensory and motor experiences how to achieve the "just right" level of arousal. Gross motor skills are an important part of childhood. Children with sensory processing differences often have difficulty playing sports and games due to difficulty following directions, poor coordination, and/or difficulty with motor planning. During GM Group, common childhood games and sports are adapted to promote success and fun. Bike riding is an exciting and fun activity for children of all ages. However, children with learning differences and sensorimotor challenges often struggle to master complex motor skills such as bike riding. At Summer Sensations, we use a specialized protocol to teach bike riding. The program builds confidence with bike handling, teaches important body mechanics, and breaks down the steps of biking riding to enable success. Everyone loves water play! Water play is an opportunity for campers to cool down and relax and provides an excellent opportunity for campers to practice social skills.